Are you confused about the process of purchasing a used car from a dealer or private party? Do you have credit or financing concerns? Don’t worry, you’re not alone. 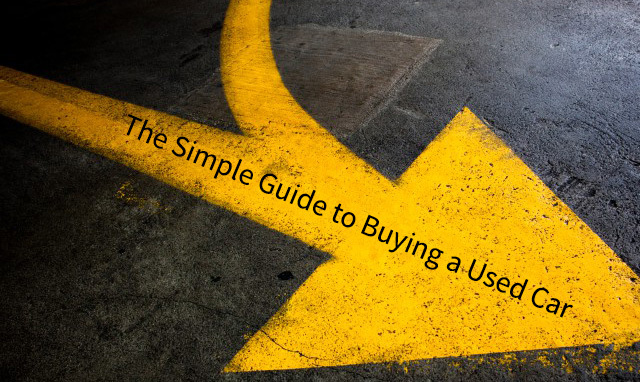 Buying a used car can seem like a stressful experience, but this step by step used car buying guide will provide you with the tools needed to make an informed decision. Buying a used car is an attractive option for drivers who want an economical and reliable vehicle, but don’t want to spend a fortune. Whether you have good credit, bad credit, or no credit, buying a used car provides a lower depreciation rate, lower payments, and a wide selection. In addition, purchasing a used car could help strengthen or repair your credit. Take a look at these five simple steps for buying a used car before you start your search for a used vehicle. 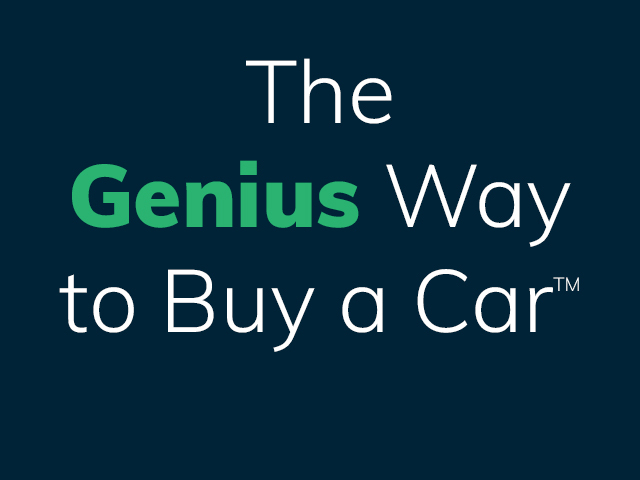 Purchasing any car is a big decision, one that you’ll want to make correctly. Planning is an important first step when buying a used car. It’s where you’ll determine reasonable goals about your used car purchase and establish your budget. Spending a little time planning in the beginning will help you determine exactly what you want and need before you go on a test drive. As a result, you’ll save time, money, and will know exactly what car you want. Will your vehicle be used to transport one person or four? Are you expecting your life situation to change in the next 3-5 years (marriage, family, etc.)? Is your vehicle for personal use, business use, or both? Will your vehicle be used to haul equipment or supplies? What type of terrain and climate will your vehicle need to withstand? How long do you plan to own your used car? Most likely, you’re not purchasing a used car just to get rid of it in one or two years. In fact, most people keep their vehicles for six years on average. It’s an investment you’re making today that will provide long term benefits, so you want to make sure it’s the right vehicle for you. By answering these questions, you can pinpoint your transportation needs and are better equipped to hone your car search. Next, it’s crucial to determine your budget. Take a look at your personal finances, and create a list of your expenses and income to determine what a comfortable monthly payment looks like for you. You can Google “free income and expense spreadsheets” to help jog your memory of monthly expenses you don’t normally think about. If you need to reduce your current expenses to accommodate a car payment, it’s important to do so prior to purchasing a car. This way, you can adjust to your new budget before entering into a payment agreement and potentially save a down payment towards your used car purchase. In addition to the asking price for a used car, you will also incur auto insurance costs, taxes, fees, and optional add-on warranties or vehicle service contracts, which will factor in to your budgeted amount. These additional costs can amount to a total cost increase of anywhere between 10-20% of the vehicle’s purchase price. Once you’ve determined your budget and know what you are comfortable with spending each month on a car payment, you can research used car options confidently while having a realistic price range in mind. With so many used car options available on the market today, conducting a thorough search will help ensure you’re happy with your used car purchase for years to come. In order to make a sound decision, you need to choose your preferred seller, identify which vehicles meet your needs, and test drive each vehicle. When researching your used car options, it’s important to consider whether you prefer to work with a used car dealer or a private party. While the decision is often a matter of personal preference, there are a few things to consider. Choosing to work with a private party may feel like a low-pressure transaction, but private parties do not have to adhere to any government regulations or BBB standards, do not provide vehicle service agreements or guarantees on your purchase, and seldom accept trades. It’s true that you can find great deals through a private party, but often at a higher risk. On the other hand, choosing a trusted used car dealership after preparing yourself to purchase a car provides the benefit of numerous options, warranty coverages, financing options, and the peace of mind associated with the purchase of a used car from a reputable dealer. To find a reputable dealership in your area, ask trusted friends or family for recommendations or search the internet for “used car dealer (your city, state)” and then check out their reputation on review websites such as the BBB, Consumer Affairs, Google+ or Yelp. Keep in mind that not all review websites verify that the reviews are left by actual customers, so look at the overall ratings and see if you see any negative or positive patterns in the reviews. Once you’ve decided whether you plan to work with a private party or a dealership, your next step is researching available vehicle options. This is where you’ll refer to your transportation needs, desired price range, and long term goals for your used car. In order to conduct your research thoroughly, it’s helpful to look at both online and print listings from multiple sources. Try to create a list of at least 5 used cars (or car types) that you are interested in and would like to test drive. But before go out on test drives, check out their insurance rates first. The cost of insuring a vehicle varies greatly based on a number of circumstances. Your personal driving history, car type, where you live, and even your credit rating all play a role in determining insurance costs. Additionally, if you plan to finance your vehicle, the terms of your financing agreement may require you to purchase full coverage auto insurance instead of just liability-only coverage. If you already have an auto insurance provider, you can contact them with your used car “wish list” for estimates on current insurance rates prior to test driving a vehicle. If you can’t afford to insure the vehicle (along with the monthly payment), why tempt yourself with a test drive? Test driving a car is always the most exciting part of the used car buying process. But, in order to get the information you need from each test drive, it’s important to fully evaluate your experience. If possible, try to test drive a used car at different speeds (without breaking the law!) and on different roads. By doing so, you can gain an accurate idea of how the car feels and note any concerns. Are you able to get in and out of the car easily? Are the controls and gauges easily read and accessed from your seat? Does the interior provide adequate body room and seat support? Are the seats and pedals adjustable to meet your needs? Can you see yourself driving this car for the next several years? How many miles does the car have? Are all interior controls working properly? Did the car accelerate smoothly? Were there any abnormal engine noises? Was the ride comfortable when going over bumps? Do the brakes feel adequate? Each used car is different and has had at least one previous owner, sometimes many more. Typically, the fewer owners a car has, the better condition it is in. 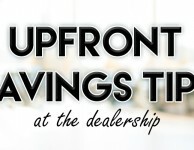 Recognizing needed repairs up front can help you make a sound choice and prepare for future ownership of the vehicle. In order to make the best decision, evaluate the pros and cons of each car after a test drive. After narrowing down your car search, you should now have an idea of how much your used car will cost. Unless you’re paying for a used car in cash, looking at financing options will be the next step in the used car purchase process. 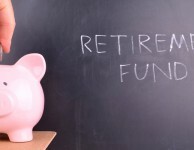 This will include a review of your income, employment history and credit history. Prior to seeking financing options, it may be helpful to request your credit reports and review them thoroughly. Make sure that all of the information on your credit reports is accurate and no fraudulent activity or issues arising from identity theft are present. Next, if you have bad credit, reviewing your credit reports will help you identify what issues are significantly affecting your credit score. 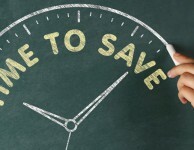 Preparing to fix these issues ahead of time will help you receive better financing options and lower interest rates. If you have less-than-stellar credit, chances are you won’t be able to obtain financing from a traditional bank or credit union. You will need to seek out a dealership that specializes in working with people in your situation. Bad credit car dealers are often referred to “buy here pay dealers” so you can search Google for “buy here pay here dealers (your city, state)” and check out the listings. Refer back to our recommendations on narrowing down the field and finding a reputable, trusted dealership. As opposed to a bank or private party, dealer (in-house) financing allows you the convenience of financing your vehicle straight from the seller. Additionally, in-house financing is generally quicker than going through a bank or private lender and can be beneficial for those with bad or no credit. As a bonus, choosing to finance your used car through a dealer may help rebuild your credit, but only if the dealership reports to the three major credit bureaus: Experian, Equifax and TransUnion. Bank financing is a popular option for many used car buyers as you have the option of using your personal bank. Banks or credit unions can offer competitive rates, simple interest loans, and sometimes exclusive benefits, such as a free services, when financing your used car purchase. However, banks are less willing to provide financing options if you have bad credit or no credit, and the process can be much more time consuming than financing through a dealership. Contact your local bank or credit union for their finance rate sheet and see what their requirements are for financing a used vehicle. If you have no credit or a shaky credit history, it’s even more important to ensure you find the right dealership to purchase a vehicle from. As mentioned before, search for your local buy here pay here dealership or traditional dealership that offers loan options for people with bad credit. Typically, a traditional dealership will require a higher down payment amount than a buy here pay here dealer, so if down payment is an issue, you almost certainly want to work with a dealer that can offer a lower down payment. With or without a down payment, financing through a dealership could help you rebuild your credit while ensuring you have reliable transportation. 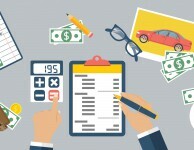 Whether you choose to work with a dealership, your financial institution, or other third party, it’s essential to pay attention to the terms of your loan with any financing option. Properly evaluating and inspecting a vehicle is the next step after your financing has been secured. Before you make your decision, make sure to review vehicle history reports, determine the car’s value and have a trusted mechanic inspect the vehicle if purchasing from a private party. Technology has made it possible to track vehicle history and provide valuable information regarding value and quality. Prior to making your decision, obtain a CarFax and/or an AutoCheck report on each vehicle you’re interested in. By doing so, you will gain important insight into each car’s repair history, damage history, and previous ownership. In order to make a purchase decision you don’t regret, it’s vital to review these helpful reports. If purchasing from a dealership, often times these reports are available to you for free. If going the private party route, you’ll have to obtain them on your own through each provider’s website at a cost of around $40 each. It’s important to remember that no report can tell you everything about a car’s history. If an incident wasn’t reported, it can’t show up on the report, which makes it even more important to purchase a used car from a reputable dealer. After researching vehicle history reports and confirming you aren’t looking at a vehicle with “extra baggage”, your next step is determining each car’s value. By determining the value of each car, you can make an informed decision about the price you’re willing to pay for the vehicle. If you’re looking at cars more than a year old, it’s important to research their current market value as each car depreciates differently. The two top resources for researching a used car’s value are Kelly Blue Book (KBB) and the National Automobile Dealers Association (NADA), both of which can be accessed online. When researching Kelly Blue Book or NADA for car value information, you will need to have the year, make, model, mileage, and a general idea of the car’s condition. 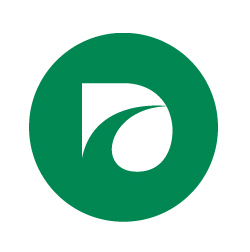 Estimated values include a range based on the car’s mileage and condition. If you’re unsure about the car’s condition, choose a value in the middle range as an estimate. While some people take the KBB or NADA value quite literally and judge the vehicle’s worth only based on their values, it’s important to remember that there are other factors to consider. Prices can fluctuate due to the demand and availability of the vehicle, seller’s urgency or a dealership’s willingness to negotiate. Use the KBB or NADA as a guide to finding a good deal, not the final word as to what you should be paying. Reputable dealerships help provide used car buyers with peace of mind, as used cars typically pass a thorough inspection or certification process before being put up for sale. While this is not the case at all used car dealerships, most nationwide used car dealers have thorough car inspection processes . However, private parties are not bound to any rules or regulations leaving the burden of inspection to you and your mechanic. Whether you’re working with a dealership or private party, it’s important to conduct a visual inspection of the car and ask a third party mechanic to inspect the car’s critical components. If it’s been a while since your first test drive, test drive the car again with your mechanic to ensure you didn’t miss any red flags the first time. While your mechanic is inspecting the car’s engine, take a close look at the interior and exterior of the vehicle. Make a note of any damage and areas that need repair. Finish up your visual inspection by using each function in the car to ensure it operates properly. For example, make sure to open and close the trunk, adjust seats, use window and door controls, inspect all gauges, turn lights/blinkers on and off, and check wipers. You can use our used car inspection checklist to help. Our used car inspection checklist is free to download and can guide you through inspecting a used car on your own. Cost is an obvious factor to consider prior to purchasing a vehicle, but should be thoroughly evaluated based on the vehicle history reports, estimated current value of the vehicle from KBB or NADA and inspection results. Without this information, you are unable to recognize whether the advertised price is reasonable. Is this price in-line with the KBB or NADA values? How much will the insurance be on this particular vehicle? Will I need to make any major repairs in the near future? Is this car currently covered by a warranty? If so, for how much longer? Can I purchase a vehicle protection plan to cover repair costs or an extended warranty? The used car purchasing process is relatively simple once you have all the information you need about your desired car. Now, you need to make sure you’re getting a fair price based on the information you have. Take a look at these last four steps before agreeing on a price. Negotiation is a powerful tool when purchasing a used car. Once you’re armed with information from steps 1-4, negotiation becomes an easy process. When negotiating, it’s important to take all factors into consideration. 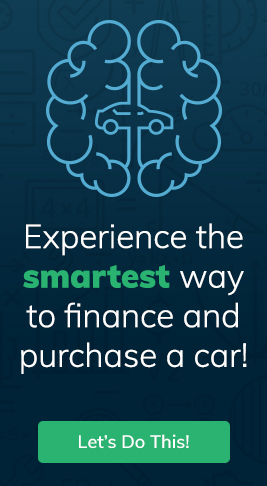 This includes the car’s history, value, and repair needs as well as your method of financing and desired monthly payment. What percentage of the price will my down payment cover? Does the car need any immediate repairs? Is this car going to provide reliable transportation? No-haggle dealerships are an attractive option for those intimidated by the process of negotiation. Each dealership is different, and it’s important to trust your investment to a reputable seller. No-haggle used car dealerships have become more popular throughout the years due to some people’s reluctance to negotiate and also increased competition in this space has forced dealerships to be more competitive, offering better pricing to consumers. Make sure to ask the dealership what their sticker price includes. Does it include all fees? How about any warranties or maintenance plans? Typically these are additional costs but it varies dealer to dealer. Do the terms of my loan require a certain level of insurance coverage? What options do I have to make payments? If working with a private party, consult the owner about any remaining warranty on the vehicle. If the vehicle is less than five years old, it’s possible it is still covered under the original, manufacturer’s warranty. If so, check to see if it is transferable and what that process entails. There may be a fee to transfer the warranty to a new owner. Dealerships, on the other hand, generally have a range of options. It’s important to note the difference between warranties and vehicle service contracts. Basically, warranties are always included in the price of the vehicle. Extended warranties, vehicle service contracts, maintenance programs or other add-ons will be extra and are typically backed by a third party but can be offered directly by the dealership. Make sure to discuss all options with your finance advisor or salesman so you fully understand the differences and coverage’s between them. It’s often an option to “roll” these vehicle protection plans into your financing for convenience, but it will slightly raise you monthly payment. Buying a used car is a great way to save money and obtain a quality vehicle. The process of buying a used car is much easier when you have the information you need to make the right decision. Following these simple steps will help you find a used car that perfectly fits your needs, is reasonably priced, and reliable. whoa…lots of info. thx! 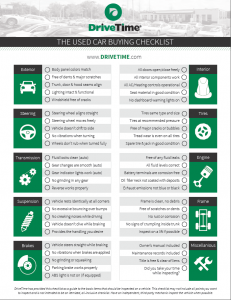 Do you use your checklist on ur own cars? Hey Amber! We use multiple checklists that are much, much more extensive than the one we provided here. This one is intended to guide you through inspecting a used vehicle. Taking all these steps makes a big difference in the quality car you buy and what you pay for it. I think doing your research and checking out Kelley Blue Book values helps you make educated choices. Great and comprehensive guide! Once you have found the used car you want to buy, ask the seller to show you the actual inspection report for that vehicle.